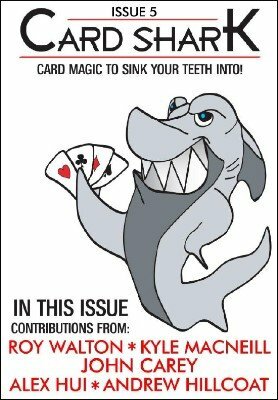 Welcome to issue 5 of Card Shark, the highly anticipated monthly card magazine that contains awesome tricks from magicians around the world. This issue contains five great tricks, which will feed your card magic needs. Strike a Match by Roy Walton – A fantastic new trick from the card magic legend that is Roy Walton. Need I say any more?! Empowered by John Carey – Brilliant magician John Carey delivers a cracker of a trick oozing commerciality, and full of spectator involvement and magic. Colour Kings by Andrew Hillcoat – An excellent packet effect from upcoming magician Andrew Hillcoat – this guy is full of great ideas, so enjoy this trick and check out future issues for another one of his great routines. Sudden Sandwich by Alex Hui – This is a named card sandwich routine, which won a competition. Have fun with this one, it is a very cool trick from an excellent upcoming mind in magic. Take it Away! By Kyle MacNeill – A cool trick that was just published in me and Cameron Francis' new Ebook – "They are What They Eat". It is a nice CAAN mixed with the Cannibal Card plot, which I think you will enjoy. Bon Appétit'! 1st edition 2012; 13 pages. The issue opens with a trick by Alex Hui which to me was the trick I liked the most though I know others won't share my view. from a shuffled deck a named card disappears from the pack only to appear in between the tabled 2 kings which never touched the deck once they're tabled. Its a nice idea but has problematic aspects. I wished for a better vanish of a named card in the pack but I didn't mind the method here because I already use it. The real problem is the final revelation; you'll do 2 moves after revealing the facedown card in the sandwich. The first is fine since the heat will be somewhere else, while the 2nd is done right where the heat is. Some people won't like it, some people might even think the construction is ridiculous. I think its interesting. The next trick debuts Scottish magician Andrew Hillcoat. Always nice to learn tricks from new names and this one is alright. Its a gimmickless packet trick where the blue backs of the 2 black kings each change color after being sandwiched in between the red backed red kings, the red kings' backs then change to blue as a climax. If you like the plot the method is quite straightforward. You'll table a double two times during the trick. As a packet trick with almost no counts, I think its fine but I cant see myself doing it. Kyle MacNeill contributes a version of cannibal cards which, quite frankly ( and sorry Kyle ), doesn't make any sense. The jokers are out & 2 selections are returned, spectator names a number between 1-52 and deals that number of cards on the table. The jokers are placed on that packet and vanish, only to come again with a card in between, the 1st selection. The card vanishes, you say their named number is quite special, since the top card of the tabled packet is shown to be the 2nd selection. So you got a card that appears in a sandwich then disappears, and the 2nd card appearing at their named number as a "climax". I find quite confusing. Also, The method wont be really deceptive if a very low number is named. You'll also be doing an Erndase color change with a packet which, depending on their named number, can be quite difficult to do. I know it is for me. John Carey's trick is a winner. A routine based on Allan Ackerman's Quick Coincidence. Spectator uses an ace to find another ace, an indifferent card changes to an ace, then the deck is up and down, all cards then face the same way except the final ace. Easily the best and the most practical trick in the magazine, taken from his DVD set 24/7. Then There's Roy Walton's trick. Its a self-working trick with only a-4-card-setup. I didn't try it out but I think it can fool a quite a few magicians. I don't know about laymen but if you're familiar with Roy Walton's style of self-working tricks, this is no exception. I think its pretty good, though I don't think many will perform it regularly to lay audiences. Quite a long review for an ebook that's less than 3$. I'd say buy it.